Virtualizing your test assets enables your organization to create robust test frameworks that can provide comprehensive test coverage while keeping costs low. Service virtualization is the process of simulating the behavior of select components within an application to enable end-to-end testing of the application as a whole. Application development teams can use virtual services in lieu of the production or real services to conduct integration testing earlier in the development process. Virtualized test assets look and act like the real thing but may be duplicated and available at times when the real assets are not available to the testing team. Virtualizing your test assets enables your organization to create robust test frameworks that can provide comprehensive test coverage while keeping costs low. Capture: A “listener” is deployed wherever traffic or messages are flowing between any two systems. Generally, the listener records data between the current version of the application under development and a downstream system that we seek to simulate. Model: Here, the service virtualization solution takes the captured data and correlates it into a virtual service, which is a “conversation” of appropriate requests and responses plausible enough for use in development and testing. Sophisticated algorithms are employed to do this correctly. Simulate: The development team can now use the deployed virtual services on-demand as a stand-in for the downstream systems, which will respond to requests with appropriate data just as the real thing would, except with more predictable behaviors and much lower setup cost. DevOps provides a set of principles and practices which enable development and operations teams to communicate and collaborate more effectively. Deploying automation enables the organization to enjoy the benefits of continuous integration and continuous delivery, significantly enhancing both productivity and agility. Understanding opportunities for acceleration is a key to software development for process improvement, and the same has to be accomplished without risking quality. Software organizations are learning that QA and testing practices must be used throughout the entire software development lifecycle. Robust testing practices enable the organization to meet the demands and challenges of continuous delivery. There are methodologies and tools available today that help to implement effective testing strategies that meet the demands of even the most complex IT systems embracing DevOps. When an organization is looking at “continuous everything,” an emerging best practice known as continuous testing is a critical component in the overall process. Another emerging best practice known as “service virtualization” enables continuous testing by providing anytime, anywhere access to a complete, simulated test environment. With the trend of agile development and increasing system interdependency, it has become extremely difficult to access all of the dependent applications. Access to dependent systems and environments is required to execute the necessary type of complete end-to-end tests. By leveraging service virtualization to remove these constraints, an organization can gain full access to the test environment, thereby enabling continuous testing to occur as early and often as needed. Service virtualization enables rapid iterative development by providing simulated test environments that can help scale continuous testing. The goal of service virtualization is to simulate interfaces and resources that may not always be available for testing due to cost or other constraints. This emerging industry best practice promises to provide a much more robust and comprehensive approach to ensuring that we can continuously deliver error-free code. Parasoft Virtualize: an open automated service virtualization solution, it creates, deploys, and manages simulated dev or test environments. It simulates the behavior of dependent applications that are still-evolving, difficult to access, or difficult to configure for development or testing. 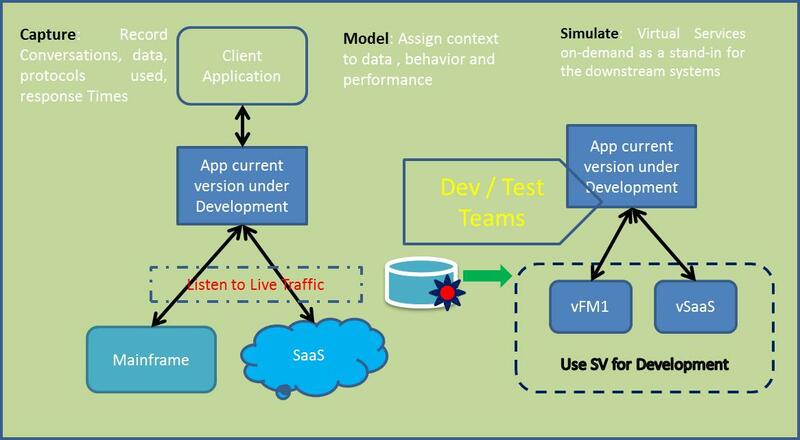 CA Service Virtualization: formerly known as LISA, captures and simulates the behavior, data and performance characteristics of complete composite application environments, making them available for development and test teams throughout the software lifecycle, for faster time-to-market with quality software functionality at lower infrastructure cost. The use of simulation technologies such as service virtualization overcomes the constraints associated with the dependent systems outside of your control in order to run meaningful end-to-end tests in DevOps. Service virtualization shifts the ability to test applications earlier in the development lifecycle, enabling integration and release processes to happen faster, with both higher quality and less risk. It also enables other nonfunctional testing, such as performance testing against a simulated connection or load testing that simulates multiple connections.